When you think about your future, you probably think a lot about money. How much have you saved so far? How much more can you save before you need to start tapping into it? Will you have enough to live the way you want to? Will it last as long as you need it to? These are incredibly important questions. For some people, they’re also scary ones. But for you, they don’t have to be. As financial advisors with a combined 60 years of experience, my wife Mary and I have a large group of clients — individuals, couples, entrepreneurs, and small businesses — who entrust us with their investing, many of them for decades. Some people come to us because they have complex financial situations that require high-level expertise. Others feel more comfortable working one-on-one with someone they have a personal relationship with, or simply prefer to outsource that part of their lives. But the fact is, you DON’T NEED a financial professional in order to easily and successfully establish, manage, and grow your investments, and create sizeable personal wealth! You simply need to understand some basic fundamental investing principles, and know where — and where NOT — to put your money, and why. That knowledge and information is exactly what we impart to you — in simple, step-by-step detail — in our Nightingale-Conant program, How to Become Financially Free on $50 a Month: Worry-Free Wealth Strategies for a Turbulent World. In it, we give you a rational, reliable, VERY easy-to-follow method that will enable you, as an individual or family, to manage your money simply and profitably, and design your own blueprint for monetary success. … all while staying AHEAD of taxes and inflation! The method we share with you in this program is the same one we use for ourselves and have passed along to our children and grandchildren — with incredible financial success. It’s the same one we use for our clients — many of whom have been with us for decades because of the extraordinary results they’ve experienced and wealth they’ve built. In fact, the same basic system used by the world’s wealthiest investors, including Warren Buffet himself, to weather economic ups and downs and remain at the very top financially. Surprised? If so, you’re not alone. Many people think investing in stocks is nothing but a game of chance, with the luckiest ones making money, and the rest losing it. The truth is, investing in stocks is usually the fastest way to accumulate wealth… and given enough time, it can be done with virtually ZERO risk. But here’s the catch: It can’t just be any stock. Only a select group of companies who have consistently met a very specific set of criteria for a significant length of time make our cut. Simply put, the companies we invest in ourselves, and recommend to our clients and to you, are the best of the best. In How to Become Financially Free on $50 a Month, we’ll tell you where to find these companies, and how to decide which ones are the right ones for YOU to invest your hard-earned money in. 50 ways to save $50 a month that are so easy, you’ll never even miss it! Investment red flags. If a company you’re considering has any of these, keep your money far away! What to do in just ONE HOUR a year to manage and grow your assets and create your own lucrative "mini-fund"
A stunning example of just how much money you can accumulate by making a few small and painless changes – even if you’re starting "late"
A lot of people get nervous or even frightened at the thought of managing their own investments. They envision having to sink hours each day into scouring the financial pages, monitoring the market, moving money around, buying and selling, stressing out over every gloom-and-doom report coming out of Wall Street… and taking a huge amount of financial risk in the process. The beauty of this system is, you don’t have to do any of that! Sure, market fluctuations will happen. You’ll hear about them on the news and read about them on the Internet. But for you, they won’t matter. Your investments will be safe, sound, and already set up so that even in a downturn, your money is automatically being maximized to give you the greatest possible return, with the least amount of risk. There’s no "wrong" age to start. We all know that the sooner a person starts investing, the more money that person will ultimately have. But that fact should NEVER hold anyone back from taking action immediately to secure the best possible financial future for themselves and their family. The bottom line is, whatever age you are, however much or little you have saved so far for your retirement, whatever your current financial circumstances, you can have phenomenal success with your money — all on as little as $50 a month. We’ve done it using this system. We’ve helped our clients, friends, even our own children and grandchildren do it using this system. WE KNOW IT WORKS, and the historical long-term results of the companies and investing method we recommend back us up. We’d love for you to experience these same extraordinary results. And it really is so easy. Find out for yourself. Click on the link below and order How to Become Financially Free on $50 a Month right now. The sooner you start, the sooner you can breathe easy, knowing you’ve taken a powerful, powerful step towards creating the wealth you need, for as long as you need it. YES, I want to find out how I can potentially add millions to my retirement with as little as $50 a month and just 1 hour of work a year! 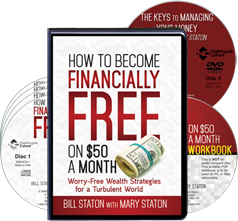 Please send me the complete How to Become Financially Free on $50 a Month program, including 4 CDs, a DVD, and the writable PDF workbook, for just $99.95 – which is $20 OFF the full retail price! I know that the quality of this program is assured, and that my satisfaction is guaranteed! Bill Staton is a Chartered Financial Analyst (CFA®) with an MBA in finance from The Wharton School at the University of Pennsylvania and a bachelor’s degree in business administration from UNC-Chapel Hill. Bill is widely known as "America’s Money Coach®." He has been Managing Director and Chief Investment Officer for Staton Financial Advisors, LLC, since its inception in 2000. He and his wife and partner Mary began portfolio management in 1997. An economic historian with 43 years in the financial-services industry, Bill has been profiled or quoted in the Wall Street Journal, Washington Post, New York Times, Barron’s, Business Week, Kiplinger’s Personal Finance, Bottom Line/ Personal, and Money magazine, and interviewed on numerous radio and television shows. Mary T. Staton is CEO and Chief Compliance Officer of Staton Financial Advisors, LLC. Mary has published several newsletters and been quoted in such publications as the Christian Science Monitor, Bottom Line Personal, Skirt magazine, SouthPark magazine, The Charlotte Observer, and Greater Charlotte Biz magazine, and interviewed on such stations as WFAE-FM and WJZY-TV.